The Air Force Two analog turntable by TechDAS, utilizes the same “Air Force” design concept as their flagship Air force One, an “air suspension bearing” and a “disc suction system” to positively exploit the aerodynamic force equivalent to sound energy rather than springs or buffer materials. 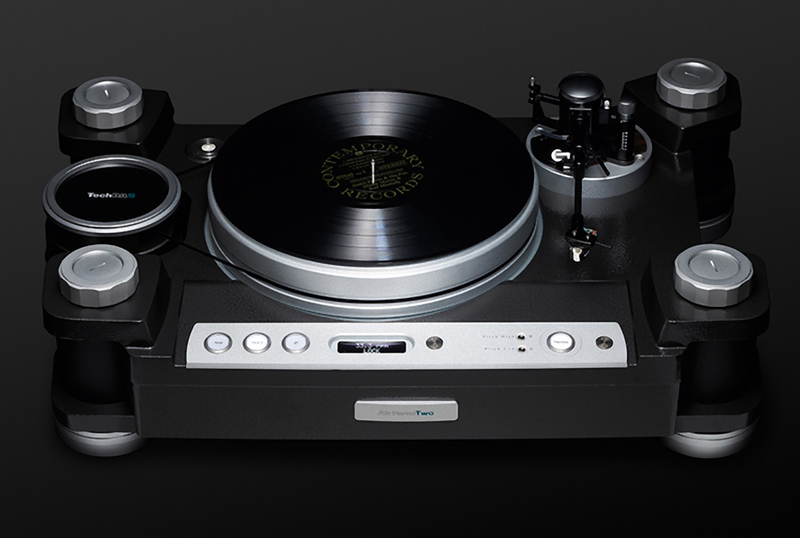 It is the ultimate mechanism based on a vibration damping design using “Air Force” and utilizes only high-precision finished parts with enough mass, which enables this turntable to pick up the micro music waveforms imprinted in phonograph records without sound “color”, which is neither added nor removed. Any displeasing, unwanted vibrations are systematically and thoroughly eliminated. • It is important for a turntable to achieve accurate and noise free stable rotation, which requires a platter with significant mass. Without compensation, over time this necisarrily heavy-weight platter can cause deterioration in the bearings surfaces and cause friction vibrations or degradation of rotation accuracies. • To avoid this potential accuracy degradation, the TechDAS Air Force Two turntable uses the “Air Force” system employed by the Air Force One, with an independent air bearing that replaces the conventional contact bearing layout. 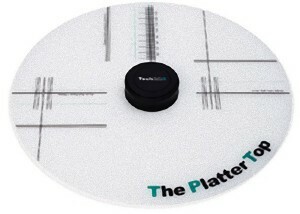 The turntable’s platter is installed on the glass plate with a polished flat surface to be aligned with the center shaft for positioning. The ancillary electric air pump starts forcing air into the turntable, raising the heavy, floating turntable platter instantly to the height of 3mm (30μ) above the base, rotating in deep silence with absolute smoothness. 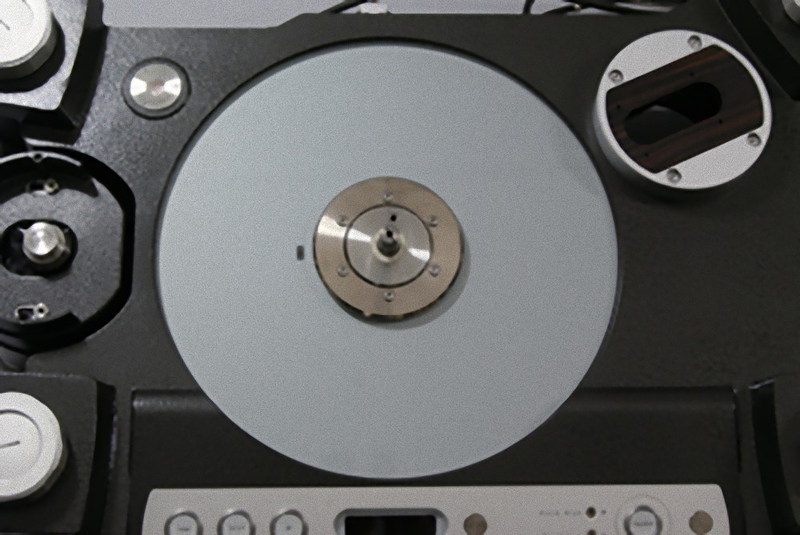 • The vacuum disc suction mechanism of this “Air force” system also provides a solution to the problem of a warped vinyl disc ensuring the fidelity of the sound source playback. • After setting a disc on the platter, just one press on the SUCTION button holds down the disc while the platter itself is floating. In a split second a completely flat disc surface is realized and most of the vertical motion by the tonearm disappears allowing the cartridge to exerts its performance to the fullest with maleficent sympathetic vibrations cleared. 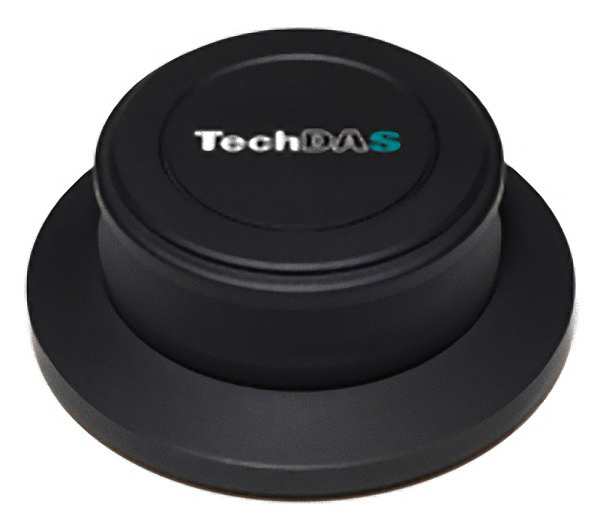 As the disc plate is attracted by means of reducing the atmospheric pressure in the air chamber located internally in the platter, this system enhances damping characteristics of the platter itself, suppress sympathetic vibrations with drastic improvement of signal-to-noise sensitivity. 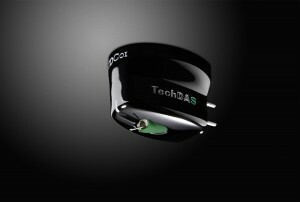 Another press on the SUCTION button allows full evacuation instantly to release suction of the disc from the platter. The key to achieving significant cost reduction without sacrifice of performance is the main body chassis, which is made of precision aluminum castings. • While the Air Force One Turntable uses a full air suspension system and a chassis machined out of a solid block of aluminum, the Air force Two turntable utillizes two precision-castings to create a four-legged structure which accommodates an upper chamber sealed with air and a lower rubberoid diaphragm with built-in springs and sealed with oil internally. This system allows an extremely high level of vibration damping while keeping manufacturing cost lower for a high performance to value ratio. 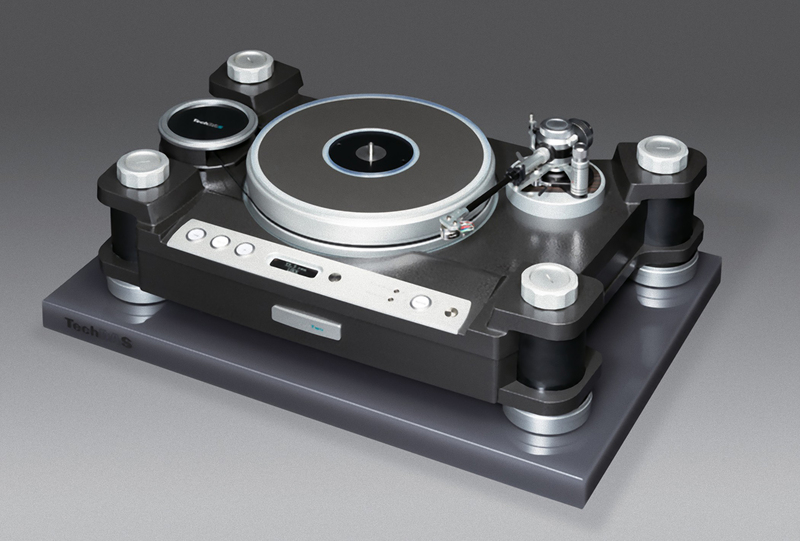 • Like the Air Force One, the Air force Two turntable chassis can accommodate two different tonearms mounted simultaneously. Standard tonearms with the effective length of 10 inches can be mounted on the right side of the turntable within standard specifications but also an optionally available arm base for the second tonearm can be installed on the far left of the chassis where a tonearm with the effective length of 12 inches can also be mounted. • The 22 pound (10Kg) main platter is machined from a solid aluminum block, (A5056). The disc-absorption surface of the upper platter is covered with special thin film damping materials. • A fabric belt-drive method is implemented in this Air Force Two system. The constant rotation speed of the heavyweight platter should be attained within a short time period and should be secured, therefore a non-stretch fiber belt is employed. The material is a 4 polyurethane flat fiber belt with a polished surface capable of excellent drive smoothness, with extremely high durability and silence characteristics. 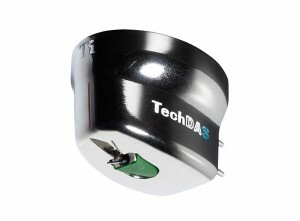 • The drive motor is combined with the air condenser which is a tempered glass chamber mechanism where air evacuated from the air pump is stored temporarily and, after absorbing the pulsating air flow completely, the processed air is fed for the air suspension bearings and the vacuum disc attraction. • Dust being such an important element to control in regards to turntables, TechDAS strived to create a solution that would be small enough to ensure constant usage but sufficient to achive the desired results. Covering only the contact surfaces with the platter is their solution. AC synchronous moter. Speed controlled by DC amplifier.